Crypto Currencies And Drug Legalization As drug legalization spread, banks are often reluctant to process payments for marijuana companies. The main reason as so long as drugs are illegal under the federal government of the US, major payment processors such as Mastercard, Visa, PayPal, among others will not process those transactions. Marijuana vendors are then forced to either credit unions or local banks that do not do business across state lines. But they are compelled to accept payments in cash. This is risky in case the business is robbed, and also customers often don’t feel comfortable or the need to carry cash in the digital age. Blockchain presents the perfect solution. Marijuana vendors and the vendors of legal drugs can accept bitcoins and other cryptocurrencies. Many vendors of legal drugs already do (depending on the nation marijuana may be legal, coca leaves may be legal, khat leaves may be legal, among others). Many of these vendors already accept cryptocurrencies as safe ways to make large volumes of sales without having to handle cash. As the regular banking industry still shuns the legal drug market, blockchain technology is becoming the de facto payment method for marijuana and other legal drugs. As customers get used to using cryptocurrencies in this sector, it will eventually spread to other sectors. Though Amazon does not yet accept bitcoin payments, Amazon Web Services is heavily investing in blockchain technology. Goldman Sachs is now trading bitcoin futures, and will trade bitcoins themselves in the future. As large institutions become more heavily involved it bitcoins, corporate use will become more mainstream for both investment and for use as active currency. As legalization spreads, Canada is due to make marijuana legal nationwide this year. By 2020, pot sales are projected to surpass weed sales. Cryptocurrencies will likely heavily be involved in this, and will grow considerably along with the marijuana market in Canada. As businesses complain about the cost of payment processors, cryptocurrencies can offer an alternative to companies such as PayPal that offer high fees for business transactions. Cryptocurrencies have the potential to bring competition to the market in terms of payment transaction, and that’s likely a huge factor in why blockchain and cryptocurrencies are now getting huge institutional investment. Blockchain is now in the process of transforming real estate. Payments can now be paid to sellors of real estate using cryptocurrency. Earlier this year, the first apartment was sold in Spain using cryptocurrency. Purchasing apartments in cryptocurrency can help foreign investors in real estate, as one wouldn’t have to rely on funds from local banks to purchase the real estate. For certain types of major transactions one is often required to make them in the local currency on funds drawn from local banks. Cryptocurrency prices are determined by world markets, so once one has purchased the relevant amount of bitcoins one can use that to purchase the relevant real estate wherever in the world, provided that the seller and the broker accept bitcoins. Those who have already invested considered sums in bitcoin can cut out the currency exchange fees, and also cut out the bank wiring fees. Properties are currently being sold in NYC to those paying in bitcoins. Using bitcoins to purchase real estate has become popular in other parts of the world as well, as bitcoin investors seek to convert their investments into something tangible. Cryptocurrencies can also be used to sell shares in buildings. The first test of this is in a buildings in Bushwick. Those who wish to invest in the building can be tokens, and the tokens represents shares of ownerships in the building. This is an interesting way renters can use to buy equity in buildings they live in. Buildings that need money for repairs or renovations can raise capital by selling tokens. This has not only the potential to completely change the ownership of private buildings, but this could even be applied to public housing. NYC’s NYCHA is a vast network of public housing that could be a city within itself. It has been neglected and chronically underfunded. NYC could issue tokens to residents of public houses. Tokens could represent their ownership stakes in the building, and the city could also raise funds to repair and renovate by selling extra tokens for capital repairs. Residents could chose to remain in public housing and a reasonable amount of money in rent (to be determined by a board elected by the owners of the tokens) or they could chose to sell the tokens and cash out of living in public housing. Cryptocurrency could be used to help reverse the devastating effect the so called wars on poverty and drugs, along with other forms of historical discrimination have had on minority communities in places like NYC. The devastation from Hurricane Maria on Puerto Rico is so extreme many maybe without electricity for months. Congress has yet to allocate an aid/reconstruction package to Puerto Rico. The entire island electrical and communications network was destroyed, along with devastation to houses, infrastructure and essentially everything else. Those with medical problems cannot necessarily get medical help as hospitals themselves have been severely damaged. Sadly Puerto Rico is but one place that has severe hurricane damage. 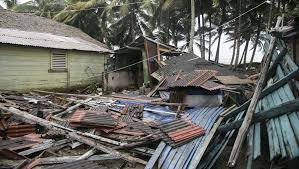 Many other Caribbean Islands also had considerable damage. The Virgin Islands, though a part of the United States like Puerto Rico, similarly have not had an aid package passed. A number of prominent politicians are now urging Congress to step up the help for Puerto Rico and the Virgin Islands. Meanwhile, other nations in the Caribbean also have horrible devastation. The Dominican Republic had considerable flooding. Flooding to this degree can spread disease, at a time with medical facilities are damaged. Mexico has recently had two major earthquakes. Rescue crews are still digging people out of the ruble. There have been over 300 confirmed deaths in the second earthquake, and 96 confirmed deaths in the first earthquake. Mexico has also had substantial property damage. Potentially tens of millions of people are affected. There are a number of ways to assist. Post Production was January and February. During the post production, the film's official website was made. Scored music was added to te film, and all the needed film editing was done. During post production we began to discuss the film's official distribution plan, discuss our next projects, etc. We settled on Amazon Video and overall VOD distribution, while we would submit the film to various film festivals for screenings. During this time we worked on a trailer for the film as well, as well as the cover art and necessary associated photos. All fun. We also finalized the film's IMDb profile. The final film can be found here. Wine Tasting was filmed in Los Angeles just before the holidays. Josh Mitchell and his crew worked fast, and the film was shot in mid Dec and wrapped up before the holidays. The shoot went well and everyone had fun. I was not able to be present as I was finishing up my last semester at Columbia University, where I graduated with a MA in English Education. Still I got the daily photo updates on Wine Tasting's official Facebook. The film can be viewed here. The first draft of Wine Tasting was written in 2013. The final draft of the spec script was written in 2015. In between I'd received feedback from BlackList readers and did my revisions. I entered Wine Tasting as a screenplay into some festivals, and it placed as finalist in Sunscreen Film Festival West, Beverly Hills Film Festival, and Evolution, Mallorca Film Festival. Wine Tasting placing as finalist got me some interviews. I was interviewed by La Libertad, Search My Trash, and by Cinemaddicts. Josh Mitchell of Wickid Pissa took notice. He proposed that he direct Wine Tasting. I agreed and worked on raising the budget till I got it. The film can be viewed here. I'm against the war on drugs and on mass incarceration. I just wrote an article on why coca should be made legal. Check it out.